From JONATHAN LUNA (GIRLS, THE SWORD, Spider-Woman, ULTRA) and SARAH VAUGHN (Sparkshooter) comes ALEX + ADA, a sci-fi drama set in the near future. The last thing in the world Alex wanted was an X5, the latest in realistic androids. But when Ada is dropped into his life, will Alex keep her? 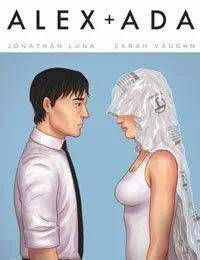 This will be JONATHAN LUNAs return to comics after three years off since the end of THE SWORD!